We are the Largest Community for Testicular Cancer Patients and Their Loved Ones IN THE WORLD! This site has been developed for the sole purpose of education and support for patients with testicular cancer and their family members. Please take a look at all of our testicular cancer resources and articles. Our site has grown to be more that just information on testicular cancer. The focus of this site is our testicular cancer support forums, where you can share your experience with and/or get answers to your many questions about testicular cancer. Testicular Cancer is a relatively rare form of cancer. Although it accounts for only 1 percent of cancers in men, testicular cancer is the most common cancer in men between the ages of 20 and 34. About 75% of cases of testicular cancer occur in men between 20 and 49. Nevertheless, testicular cancer is one of the most treatable forms of cancer, with cure rates approaching 100% if detected early. Additionally, testicular cancer is more common in white men than black or Asian men. 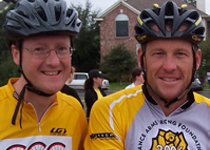 Our very own forum administrator, Scott Joy, photographed here with Lance Armstrong at the 2006 Ride for the Roses. Shanteau, 24, of Lilburn, Georgia, was diagnosed with testicular cancer 6-19, a wk before he left for the U.S. swim trials. TC-Cancer is proud to be partners with Check ‘Em Lads, a fun and interactive way to get information about Testicular Cancer out into the community. Be sure to check out their site! Check ‘Em Lads - Testicular Cancer in a new and fresh eye!